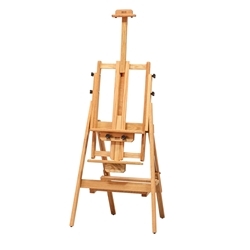 Best Rio Grande Solid Oak Easel - A great starter easel. This multi-functional easel has a strong quad base and was designed for easy adjusting. It will extend upwards to handle a 48 inch canvas, yet compact down to 45 inches overall height. Fully extended height is 72 inches. Adjusts quickly to a variety of settings for sitting or standing. Includes a middle canvas tray for small work. Base width is 25 inches with a 23 inch depth. Each BEST Easel is made of American oak, sanded to a smooth surface, then hand-rubbed with oil to reveal the inherent beauty of the wood grain. The craftsmen at BEST nail, glue, and wood screw every joint, guaranteeing strength and precision. Only the highest quality hardware is used as these easels are constructed to last a lifetime. This easel can be shipped by UPS for $39.95 anywhere in the 48 contiguous states. Assembly required.